Music begins where words lose their meaning and when music reaches the standard it has on this album, it's well-nigh impossible to verbalise it. I received a rough copy of this record long before it was finalised. It had no title. All that was written on it with a felt pen were the names of the two artists: Bela Szakcsi Lakatos, arguably the greatest jazz pianist in Hungary and Miklós Lukács, the phenomenal rising young star of the cimbalom (a folk instrument not unlike the hammer dulcimer and much loved by the Gypsies of Hungary and Romania). Szakcsi Lakatos has recently recorded an album with his own trio that brilliantly fused his Romany Gypsy musical heritage with mainstream jazz, while Lukács has been playing with the leading lights of Hungary's incredibly rich ethno-jazz movement and also appeared at the 2004 London Jazz Festival with Arnie Somogyi's Improvokation, a highly original Anglo-Hungarian outfit. So, what was one meant to expect? Before putting the CD on, I was wondering how on earth a piano and a cimbalom will sound together without the mediation of a solid rhythm section? Will it be Gypsy jazz? Will Szakcsi Lakatos 'brilliant pianism', as a noted British critic (Alyn Shipton) described it, bury the cimbalom? To be frank, I was not prepared for what I was to hear. The music struck me as a conversation between equals, as two men were telling a long and involved story with several interesting and dramatic, frequently humorous twists to it, sometimes speaking excitedly at the same time, sometimes taking turns and sometimes embellishing the story as told by the other. Bela Szakcsi Lakatos, with the humility of the truly great artist he is, was not trying to drown the younger man out, while Miklós Lukács, the brilliant exponent of his uncommon instrument, took the cimbalom into regions where it had never ventured before. This is contemporary music of the highest order but without the ugliness - 'de rigeur' nowadays - that's meant to convey the sorry state of the world we live in. The music is life-affirming, invigorating, thought-provoking, full of feeling and does owe its debt to jazz inasmuch as it's improvised from beginning to end, but the Hungarian and the Gypsy are also there while the influences clearly stretch from Bach to Bartók. This is a tour de force, a meeting of minds, a tremendous and unique experience. P.S. The music was recorded in just eight hours, improvised from beginning to end. Bela Szakcsi Lakatos and Miklos Lukacs were called upon on a whim since there was an expensive studio all paid for but not used for a couple of days by BMC. Top that! Béla Szakcsi Lakatos appeared in the fifties and sixties in guitarist Andor Kovács' group, but by the mid-sixties he was performing with his own band. In 1970 he won second prize at the Montreux Jazz Festival with Aladár Pege's quartet. From Zürich to Warsaw, from Nürnberg to Belgrade, from North America to Asia he has performed at the most prominent festivals. 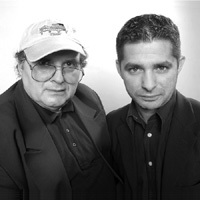 As the soloist of Special EFX created by George Jinda and Chieli Minucci, Szakcsi featured on eleven albums as composer and performer, and it was thanks to these that in the middle of theeighties he was able to make a contract with the American company GRP (Sachi, 1988; Mystic Dreams, 1989; Eve of Chance, 1992; Straight Ahead, 1994). Szakcsi's qualities as a composer and performer were appreciated by Chick Corea, and he has played with great figures in the genre, such as Carmen Jones, Frank Zappa, Art Farmer, Mark Ledford, Dave Weckl, Omar Hakim, Terri Lyne Carrington, Marvin 'Smitty' Smith, Jay Leonhart, Gerald Veasley, Victor Bailey, Randy Roos, Attila Zoller, Rodney Holmes, David Sanchez, Bob Mintzer, John Patitucci and Jack DeJohnette. Historically, it is Szakcsi whom we must credit with the spread of fusion jazz in Hungary: from the beginning of the seventies, he taught jazz piano at the Béla Bartók Secondary School of Music. In the meanwhile he was also occupied with collecting Gypsy folklore and forming it into stage works. His first Gypsy musical, Red caravan was shown in 1975, and was followed by Once upon a time a gypsy girl and Cartwheel. In 1989 he wrote a rock opera entitled The beast about Erzsébet Báthory, and in the quincentenary of the discovery of America he presented a one-hundred-minute ballet at the Hungarian State Opera. Szakcsi is equally at home in all these musical genres. He recorded Hungarian folk song arrangements with the opera singer Ádám Horváth and the folk singer Gyöngyi Écsi (My flower, my flower, 1988), and pieces for four hands with the pianist György Vukán (Conversation for two pianos & orchestra, 1998; Das Duell I-II-III - Vukán-Szakcsi in Gottingen, 1998; Conversation plus, 1999; Fourhand, 2000); in the meantime more jazz recordings were made with Imre Kőszegi and Jackie Orszaczky (Journey in time, 1998), Bob Mintzer and Peter Bernstein (On the way back home, 2001). Over the last ten years he has immersed himself in the study of the compositions of György Kurtág, György Ligeti, Péter Eötvös and Pierre Boulez, resulting in the album In one breath (BMC CD 061) made with the violinist Lajos Kathy Horváth, in which he pays a homage to these composers in his improvisations. In 2004 he recorded Na dara! (BMC CD 103) with the drummer Peczek Lakatos and the bass player György Orbán, with Roma singers lending an authentic colour to the trio. The year 2005 will also see the release of his recordings with the French trio La Campagnie des musiques a ouir, as well as the guitarist Gábor Gadó and the violinist Balázs Bujtor. The Hungarian State recognised his work by awarding him the Liszt Prize in 1987, the Artist of Merit award in 2002 and the Kossuth Prize in 2005. Miklós Lukács was born in Törökszentmiklós in 1977. His father played the cimbalom too, and his mother played the violin for ten years. He began studying music in the Aladár Tóth Music School, under Ágnes Szakály. At the age of nine, he attained second prize in the adolescent age group in the Aladár Rácz cimbalom competition. His first performance abroad took place in 1990: he gave a solo concert in Brussels, organised by UNICEF. From 1991 to 1995 he continued his studies at the Béla Bartók Conservatory, where his teacher was again Ágnes Szakály. It was at this time that his interest in jazz, particularly improvisation, began to grow. After finishing the conservatory he was admitted to the Ferenc Liszt Music College, and graduated in 1999. At the college he trained with the instruction of Ilona G. Szeverényi. In 1997 the Cimbalom Friendly Circle Foundation was formed, and he became a member of the board of directors. He featured at festivals organised by the foundation as both performer and composer. Many of his works were played, including the Cimbalom Concerto for cimbalom and chamber orchestra, dedicated to Ágnes Szakály. In 1997 he featured as a soloist on the disc Liszt: Six Hungarian Rhapsodies by the Budapest Festival Orchestra. In 1998 he performed in the United States as a soloist of the Concertante di Chicago chamber orchestra. The great success led to the orchestra being invited back for the next season. In 2000 he received the Artisjus Prize. After his college studies, in addition to classical music he immersed himself in other musical genres, primarily jazz and ethno music. To this day he is a member or a permanent guest of many formations, including Kvartett B, the Borbély Workshop, Irén Lovász, the Csaba Tűzkő Septet, the East Side Jazz Company, the Mihály Dresch Quartet and Improvokation. As well as performing he is active as a composer: in 1993 he wrote pieces entitled Hazám (My Country) for the Krétakör Theatre, and Divertimento for chamber orchestra and cimbalom for the ELTE Chamber Orchestra.